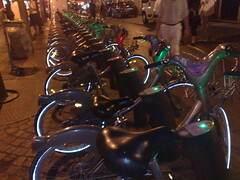 velib’ is a portmanteau of the two French words velo and libre, so a good transliteration would be freecycle. Unlike the US freecycle however, this one is free as in freedom, not free as in beer. French has different words for these concepts, so the confusion doesn’t arise. 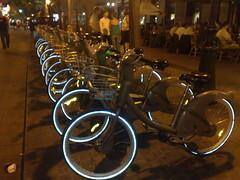 For just 5€ you can use the bicycles as often as you like for a week, provided each journey is less than 30 minutes. There is a bit of fiddling around choosing a working bike and typing the numbers into the kiosk to take it out, but the basics are quickly learned. So far, I am pretty impressed with the system. It has only been around for a year and it seems to be well used. It helps, of course, that Paris has lanes especially for buses, taxis, and bikes. Of course it has a few problems. you can buy a one-day ticket (1€) and swap a bike out. The obvious solution is the supermarket trolley approach. When the racks are full, it should be possible to stack the bikes (not vertically of course—that would be silly). They don’t tessellate as nicely as supermarket trolleys, but they could line up side-by-side. 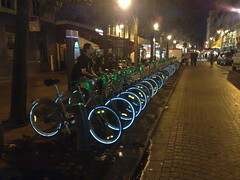 More recently we saw the opposite problem: a rack completely devoid of bikes! Neither of these problems has yet done more than delay us a few minutes, though this could be very different when late for an urgent appointment. There are lorries that come by to load up bikes from full racks, and presumably populate the empty ones. I had an idea about paying homeless people to move bikes around, but I have no idea how well that would work. Another obvious shortfall is that there is no user feedback facility. When I check in a bike, I would like to be able to note whether something is wrong with it. 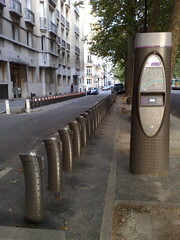 The Parisians have created a convention of turning the saddle around to indicate an unusable bike, but this is not universally understood and doesn’t seem to be noticed by the velib’ administrators. Of course the saddle could be turned to any angle, so treating it as a single bit seems wasteful: it could be turned a little to indicate a usable bike with an irritating defect (like out-of-tune gears), or by greater degrees according to the severity of the defect. Turning it left or right could also carry some information, though I can’t think what. The one defect that can’t be indicated in this convention is when the saddle cannot be adjusted. If you plan on using these, you may want to consider purchasing a Navigo card, which obviates much of the fiddly kiosk interaction. These passes are mainly for Métro travel and cost 5€ if you live outside France. You should also visit a Monoprix shop to buy a velib’ map. These are very handy for planning your travel and for looking up the nearest station when out and about. I did download a PDF map to my phone but it wouldn’t draw the bike rack symbols properly and it was a very poor quality map to boot. Lastly I note that the bikes are used in an unexpected way. Quite often, people just go and sit on the locked bikes, either to chat or to reflect quietly on their own—probably just because they’re comfortable seats waiting to be used.